Mgr. art. Vladislav Soltys ArtD., artistic name Benito, graduated on the Academy of Performing Arts in Bratislava. During his studies he worked in a dance company Torso Ballet and Austria dance group cieLaroque. In company The Bratislava Dance Theatre has performed in productions Wedding, The Firebird, choreographed by John Ďurovčík and performance of Romeo and Juliet. After graduation, he performed as a dancer in Landestheater Linz led by Robert Poole. Three artistic seasons he worked in Volksoper Wien and choreographer Lize King, where he performed at the legendary Swan Lake Remix, Caravaggio, Noddingdog, Underworlds, Jekyll and Hyde and Je Veux - Je Veux. In cooperation with the Austrian director Martin Gruber and his expressive theater AktionstheaterWien participated in the performances Vogel, Persians and Liebe Mich. 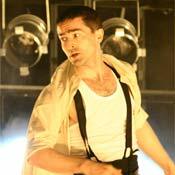 In 2005, In The Slovak Dance Theatre he participated in performance Bolero. For Laban Atelier participated in performances and The smooth edges for Dajv in performance Manual - súčasnýtanec.sk. At 2005 performed for The Slovak Dance Theatre in Bolero. During the years 2003 - 2011 he was a member of the Irish group Fabulous Beast Dance Theatre and choreographer Michael Keegan Dolan. During this cooperation has performed in Australia, New Zealand, Ireland, UK, Poland, Germany and the USA in the performances of Giselle, The Bull, The Flowerbed, James son of James. For England National Opera in London in performance Rite of Spring. In 2009 he performed his solo King at the festival Bratislava in Movement. For dance company cieLaroque performed esnes.n.on in Austria, Singapore, Malaysia and India. For elledanse company participated in performances Apple, Quadrans and Water for the water. As dance teacher worked for the elledanse in Bratislava, he led the workshops for Laban studio, at the Private Conservatory in Košice, dance workshops at festivals 4plu2 and festival ProArt in Brno and Prague. Between 2012 - 2014 he worked at the Dance Conservatory of Eva Jaczova in Bratislava as a senior teacher of modern dance. After postdoctoral studies at the Academy of Performing Arts in Bratislava, he is working as an internal teacher of contemporary dance and dancetheater. During her dance career he was intensely devoted in art of Hatha Yoga and Japanese fencing art Battodo. explore the possibilities of body motion with avoiding the established movement patterns. Brno 17. - 22. 7.